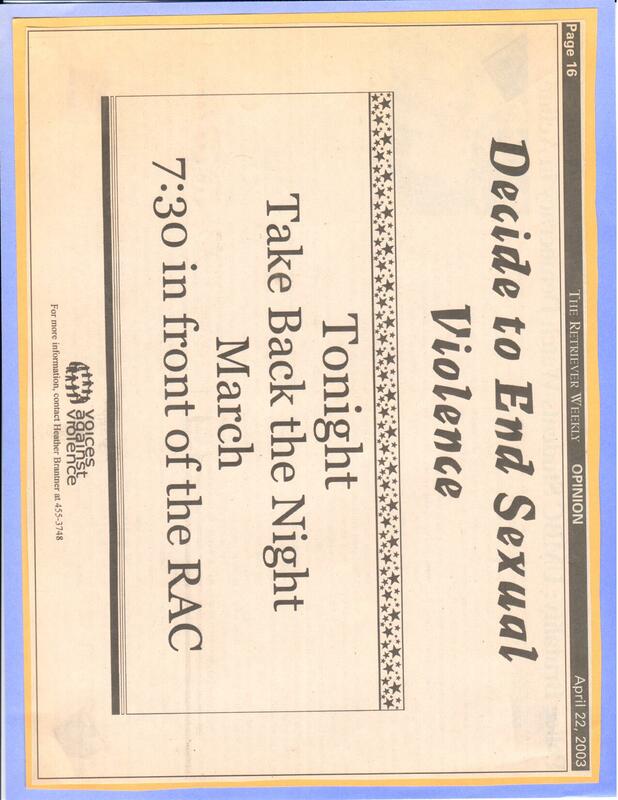 This week we’re featuring event flyers from of our Take Back the Night. Since Take Back the Night 2017 just happened a few weeks ago, the experience may be fresh in many of our minds. As social media and technology has enhanced over the past several years, it’s always interesting looking back at old event flyers and Take Back the Night is no different! As we’ve been diving over the archives this past year, it’s neat to see the ways in which promoting Take Back the Night has evolved. From basic event flyers to hashtags and geofilters, the importance of getting students to this critical event remains constant. One of our first TBTN flyers from 1991. One of the newer TBTN flyers from 2016. This year Kayla Smith shows off our newest flyer and logo! Kayla-ception via SnapChat!! 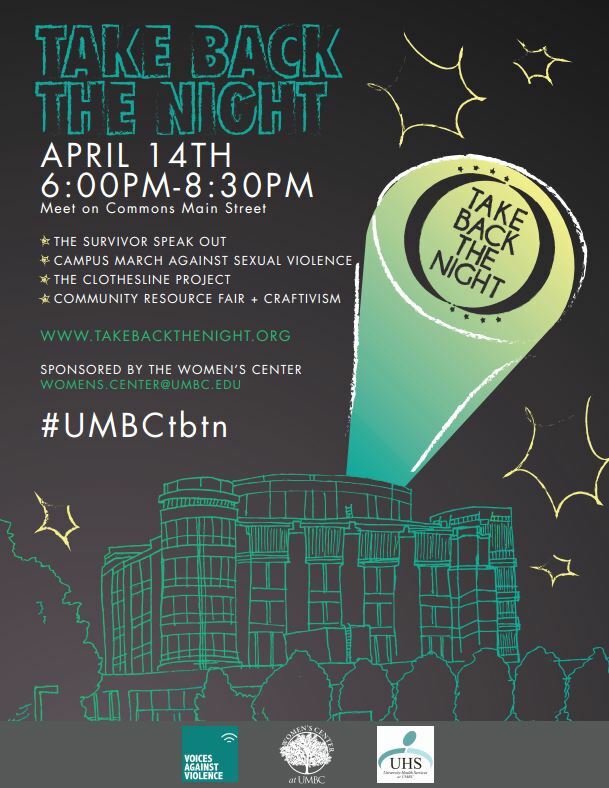 You can learn more about the history of Take Back the Night at UMBC by checking out our recent blog post on just that! 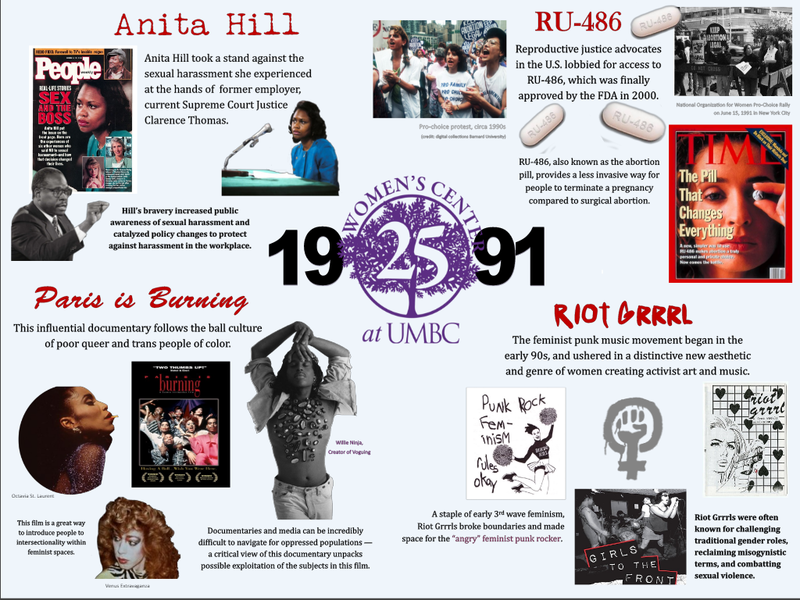 This week we’re featuring the history of the Women’s Center event and programming tabling and outreach! An important part of the Women’s Center vision has been education and outreach. 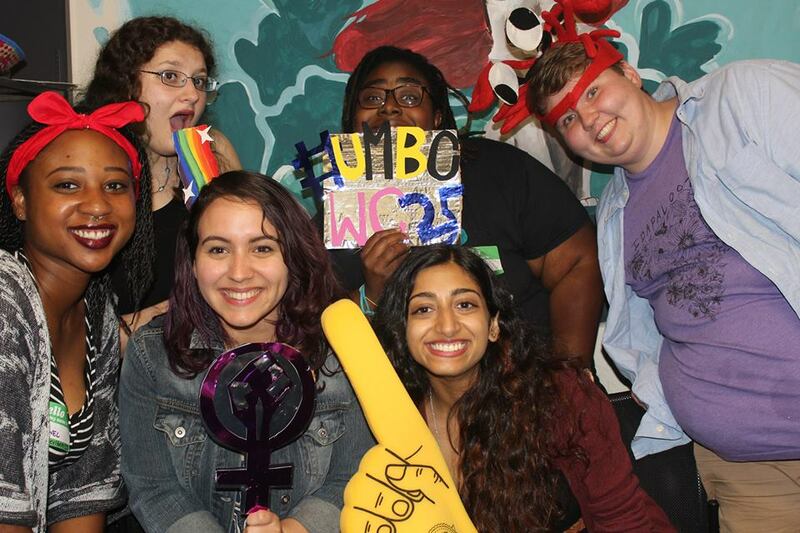 Since our opening in 1991, the Women’s center has continually been dedicated to campus and community outreach and providing resources related to women’s issues, social justice, and feminism to the UMBC community. Today, the Women’s Center tables at numerous events throughout the academic year. 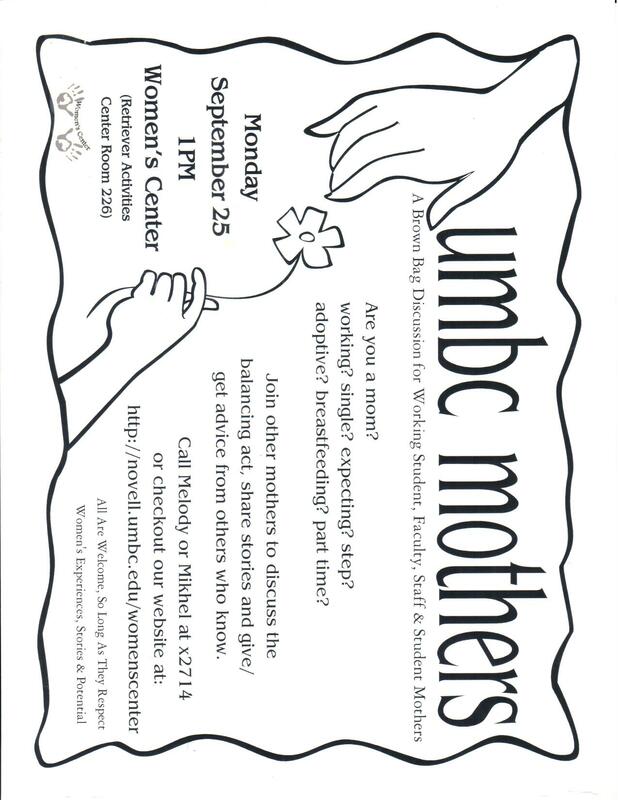 Both student and professional staff take time out of their day to help inform UMBC community members about campus, the Women’s Center and community resources. We also table for special days like National Coming Out Day and critical initiatives such as the Telling Our Stories Project. Next time you see us tabling, be sure to stop by, say hi and check out our resources!! Former Women’s Center Director Dr. Mollie Monahan-Kreishman, Administrative Assistant, Eryl Pettit and Student Staff Mahnoor Siddiqui tabling on Mainstreet back in 2010! Celebrating National Coming Out Day at our 2015 NCOD tabling event with Women’s Center Staff member, Kayla Smith! Women’s Center 25 Then vs. Now: Our Anniversary Celebrations! 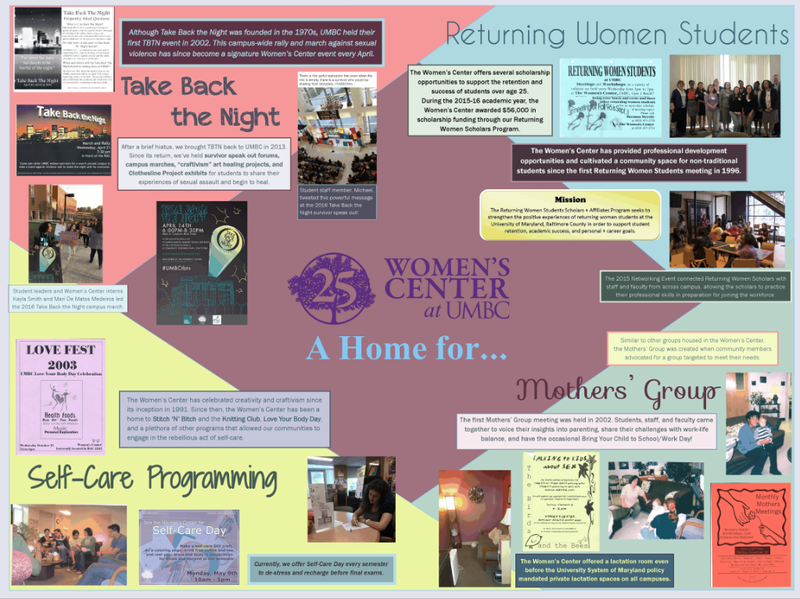 This week we’re featuring the history of Women’s Center anniversary celebrations! The Women’s Center has always had something to celebrate. We often talk about how women-centered spaces and activists spaces by their very nature are radical and bold and well, we find that worth celebrating. As you already know, this year the Women’s Center is celebrating our 25th anniversary. We kicked off the year with a birthday party where some of our founding members and critical people in our history spoke about the importance of Women’s Centers and the way they had seen the Women’s Center grow over the years. We had cupcakes, enjoyed a feminist- inspired photo- booth, and had a wonderful time. Throughout the year, we continued to document and celebrate our history at events such as Critical Social Justice and welcoming Provost Rous to the Women’s Center to meet with current students, staff, and faculty. We also reached out to alum and former staff members over the year and created a 25 Friends of the Women’s Center to honor those who have given of their time and resources to support our work. But how have we celebrated past anniversaries? During our 10th year of operation, the Women’s Center hosted a chair making event in which student organizations and departments connected to the Center, decorated a chair to represent themselves in the space. For many years, these chairs lined the walls of the Women’s Center as both decoration and useful places to sit. While the chairs are not out in our space on a daily basis anymore, you’ll see them make an appearance during roundtable events or other gatherings that require additional seating. For our 20th anniversary, the Women’s Center Advisory Board and professional staff were committed to hosting large anniversary celebrations over the course of the year. Key events included our opening and closing picnic, a collection of women photographers featured in the Library gallery, and a service project at a local women’s shelter. UMBC student, Stefanie Mavronis, ’12 , interviewed many UMBC students, staff, and faculty for a digital story telling project to capture the theme of the anniversary: 100,000 Stories – Which One is Yours. In the spirit of the chair decorating that happened in our 10th year, we created a quilt featuring student organizations and departments that continue to be important to who we are as a Center. Unveiling the 20th anniversary quilt lovingly crafted by student staff member, Lizzy Wunsch, Class of 2015. It’s been a while since our last post because we were prepping for Critical Social Justice. Consequently, this week we’re featuring the awesome posters + a Prezi presentation student staff put together highlighting the Women’s Center history which was showcased at this week’s Critical Social Justice event addressing diversity and inclusion within higher education. The posters are hanging up in the Women’s Center right now so stop by to check them out. In the meantime, here’s some photos of the posters Shira and Michael made and the link to Daniel’s Prezi Presentation. Prachi also made a really cool zine about our history that we’ll be adding to the 50th Anniversary time capsule that we’re working to get online. 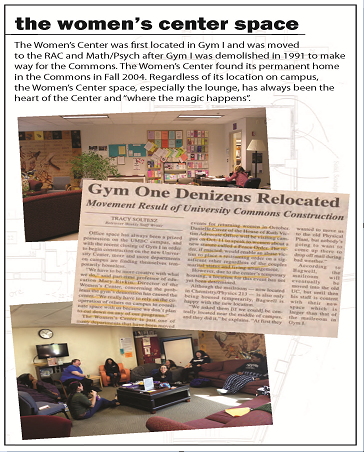 In the meantime, you can pick up a hard copy the next time you visit the Women’s Center. Michael focused his poster on important Women’s Center programs and their evolution of the past 25 years. Prachi created a multi-page zine documenting the history of the Women’s Center. Here’s just one of the pages. You can check out Dan’s cool Prezi presentation, Historical Foundations of the Women’s Center at UMBC, that explores the evolution of women’s centers and women’s movements from a holistic perspective which he was then able to connect to the programming and services our specific Women’s Center has offered over the years. A screen shot of one of Dan’s slides from Historical Foundations of the Women’s Center at UMBC. This week we’re featuring a sampling of the various events and programs hosted in the Women’s Center over the past 25 years. 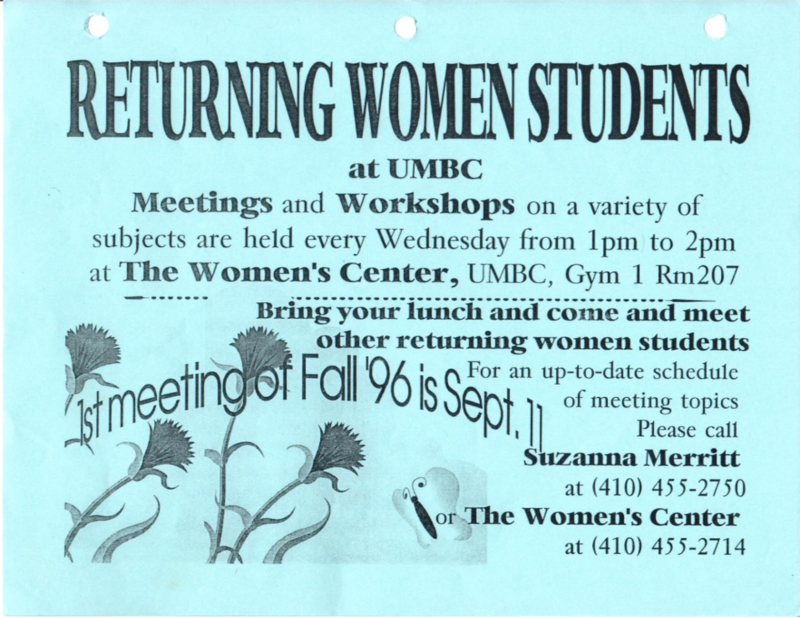 The very first Returning Women Students group took place in 1996. This group still is an critical part of the Women’s Center programming and has also morphed into a scholarship program. The Clothesline Project is an artivism display the Women’s Center exhibits during Sexual Assault Awareness Month. Even in 2006, the Women’s Center was just as dedicated to telling the stories of survivors as they are today. 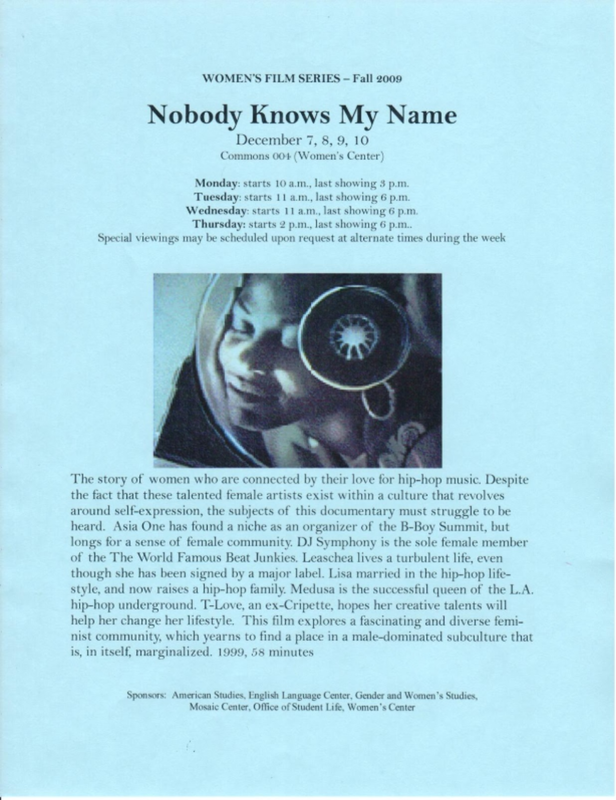 Before the era of Netflix and Youtube, the Women’s Center (in co-sponsorship with other departments) held film series which spotlighted women’s voices and experiences. 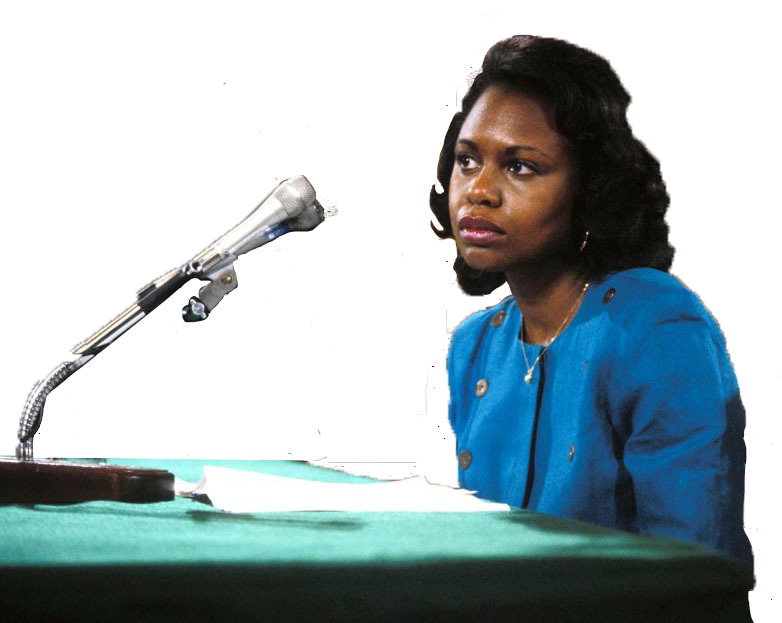 While our editing skills have definitely grown since 1991, we have remained dedicated to critical social justice and centering the voices of women. 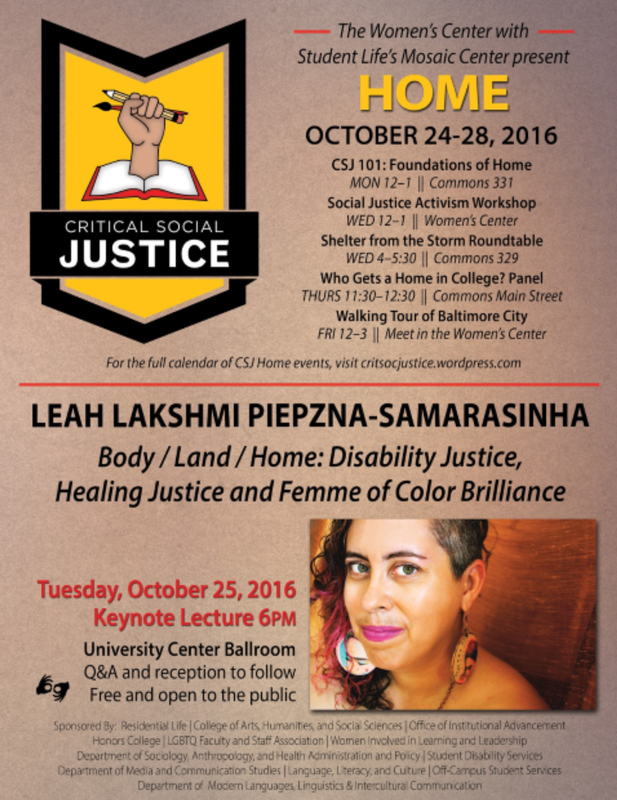 Be sure to join us for our Critical Social Justice Keynote speaker, Leah Lakshmi Piepzna-Samarasinha.